Part II in a series that follows our renovation of a Chevy Chase, Maryland home. 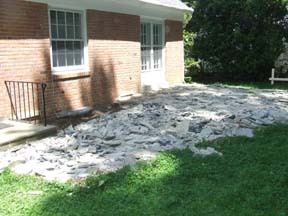 In preparation for the new breakfast room addition and screen porch, the existing masonry patio must go. We carefully removed and stacked the existing flagstone paving so it can be re-used later on in the project. 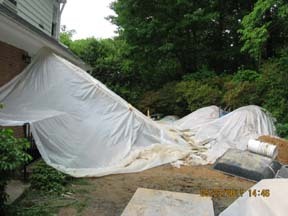 Though we intended to re-use portions of the existing concrete slab for the floor of the new screen porch, major cracks and settlement were discovered so the entire slab was removed. April showers, well, they brought May showers. The frequent rainstorms of late had the potential to hinder progress on this Chevy Chase, Maryland renovation. Fortunately, with a little on-the-job ingenuity; excavation, footings, and masonry foundation walls have proceeded on schedule. 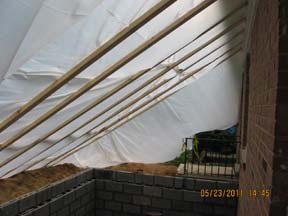 14 foot long 2×4’s were secured to the existing house and covered with plastic to create a lean-to that sheds water away from the newly excavated hole, keeping things nice and dry as the breakfast room addition quickly rises out of the ground. Keeping the new breakfast room foundation dry ensures a clean, healthy environment is maintained throughout construction, eliminating the potential for mold. Perimeter drain tile and exterior waterproofing will soon be installed to collect and direct any future water away from the new foundation. Continue following Pagenstecher GROUP as we transform this Chevy Chase, Maryland home.